Bhopal: Madhya Pradesh Chief Minister Shivraj Singh Chouhan has urged the people to contribute their maximum and join hands with the government to build a “golden Madhya Pradesh”. 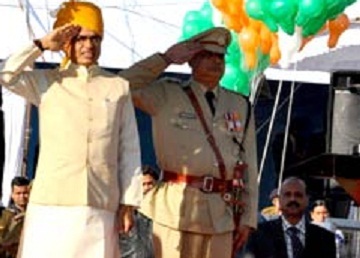 The chief minister was addressing the people after unfurling the National Flag and taking salute at the Republic Day parade at Ratlam on Tuesday.He expressed confidence that the State will maintain the high growth rate even this year. The chief minister asked the people to conserve water and save electricity, educate girls and take a pledge for de-addiction. He underlined his vision saying we should take pledge to make Madhya Pradesh the most prosperous state not only in the country, but in the entire world. The Chief Minister sought people’s cooperation and said all should connect with the Swachchh Bharat Abhiyan (Clean India Campaign) and resolve to keep their houses and the environment clean. He said that toilets have been constructed in 50 lakh households till December 2015. A target has been set to make all 52000 villages in the State open defecation free.